My favorite plant this week is Collinsia verna, or blue-eyed mary. 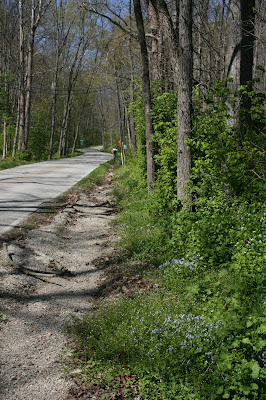 The plants photographed here are found in Warren County, Ohio growing along a rural road. I used to live in this area, and had seen this plant several springs but never remembered to ID it and collect seed. I had not seen this spot for years, and on a drive home after a meeting in Cincinnati, I decided to check it out. I remembered only a small population along the road, but was surprised when I found thousands of plants growing on the terraces above Dry Run. This member of the Scrophulariaceae/Plantaginaceae is a spring ephemeral with an interesting quirk. Rather than being a long-lived, slow-growing perennial like many other herbs of the forest floor, this species is an annual. I can't understand why I haven't seen this in any gardens. Blue-eyed mary is an indicator of high quality woodlands. Also found in this area are; Trillium grandiflorum, Trillium sessile, Phlox divaricata, Delphinium tricorne, Polygonatum biflorum, Uvularia grandiflora, and many others.